Joanna Kramer (Meryl Streep) walked out of her life, away from her husband, Ted (Dustin Hoffman) and son Billy (Justin Henry). Suddenly, Ted and Billy are thrown into a world here they must do everything themselves and it is hard. Eventually, though, they get the hang of it and things are going well. And then Joanna turns up again and wants to take Billy back and they end up in court. This was such an important film of its time. Divorce was certainly not a new thing, but was on the increase, and then there was women’s liberation, women wanting to do things for themselves (silly women) and how do people deal with this new world? 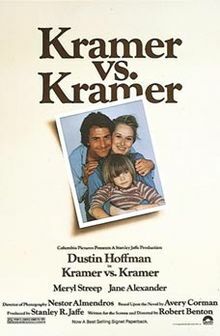 I think that if another Kramer vs Kramer would be absolutely and totally different were it made now. I think the relationship breakdown could be similar, but I like to think that most men are a bit more involved with their children than Ted was before Joanna left and that workplaces are not able to be as blatant about putting work before family. Most importantly, I think the legal system has progressed. Or perhaps I live in my own little world of things being right. Kramer vs Kramer won Oscars for Best Picture, Best Actor in a Leading Role (Dustin Hoffman), Best Actress in a Supporting Role (Meryl Streep), Best Director (Robert Benton) and Best Writing, Screenplay Based on Material from Another Medium (Robert Benton) and was nominated for Best Actor in a Supporting Role (Justin Henry), Best Actress in a Supporting Role (Jane Alexander), Best Cinematography and Best Film Editing.